No MIPS, MIPS > RISCV. riscv64 is coming... give it time. Just going with what tools Ubuntu PPA give me. Debian still has far greater arch support. 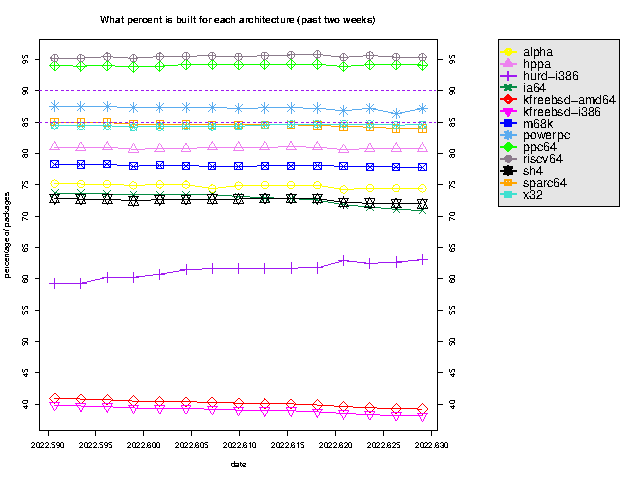 Good news is that the number of packages being built with riscv64 (the official arch name) is increasing. Just a Linux designation for 64-bit IBM architecture for mainframes (IBM Z). I doubt that OpenMW will have many users on this platform (sysadmins during work time? ). s390 (without x) is a designation for old 32-bit architecture (IBM System/390 series mainframes). You'll be surprised how bored some sysadmins get. Heck, I work with a guy who hosts a VMS development cluster on Alpha and Itanium machines. Another guy who worked there has an old Alpha mainframe at home that he runs Gentoo on. Any particular reason why the 32-bit build is a day behind the 64-bit one? Not that I use the 32-bit ones, but, I thought I'd point it out in case there is an issue. There's an authentication issue on the upload server, so uploads seem to randomly fail. People are looking into it. Seems like my Windows died while I was off at a conference in Berlin, started it up again though now that I'm back and the nightlies seem to be rolling along as usual. This was the last one to work.